If you have always wanted a Macaw as a pet, and wondered if there existed such a thing as a quiet Macaw, you might as well keep looking. 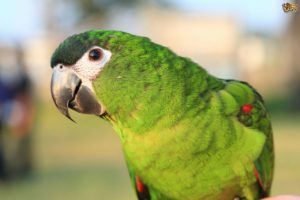 The loyal and loving Green Macaw has been known as the breed of Macaw less prone to loud screeching, a fact that most Macaw owners can tell you makes the Green Macaw an extremely attractive choice. A subspecies of the Military Macaw, the Bolivian Green Macaw hails (of course) from Bolivia and Argentina. The Bolivian is known to carry the general appearance of the Military Macaw, but with a reddish-brown throat, an extra outer webbing of flight feathers, and occasionally a darker tinge of blue on the tips of the tail feathers. As part of the Green Macaw family, the Bolivian Green Macaw is known to be at least slightly more vocally docile than their genetic cousins, though still talkative, and just as affectionate, intelligent and curious. The Bolivian Green Macaw’s natural habitat is that of a tropical forest, but it avoids the humid areas’, generally keeping to flocks of eight to 40 other birds. In captivity, the curious Bolivian Green Macaw is a devout lover of toys, puzzles, talking and most of all, chewing. If kept in a cage, the cage should be very large and spacious, as the Bolivian Green Macaw is a large bird who enjoys space and may become more vocally agitated if not given enough space. Also be forewarned that, as a lover of puzzles, the Bolivian Green Macaw will see the lock on its cage as just that — a puzzle that can and will be solved, if not secured well. 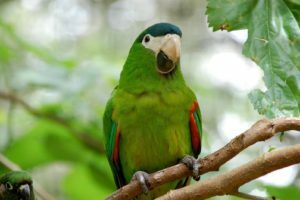 Overall, if what you are seeking is a warm and affectionate pet that will talk to you, day and night, for many years at a stretch, the Bolivian Green Macaw may be just what you are looking for. They are, however, very expensive at $800 to $1000 per bird. The Green Macaws are also, now, endangered in Argentina and Bolivia due to trade, hunting and habitat loss; a point which anyone should keep in mind before buying an animal. 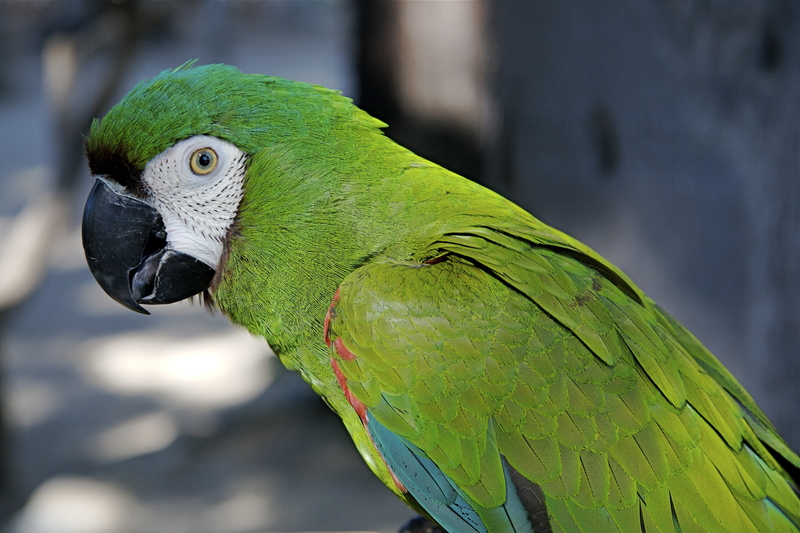 The overall color of the Bolivian Green Macaw is olive green, with an offset of red feathers on its forehead and directly behind the black beak. The primary wing feathers are a deep reddish blue and the tail feathers are a ruddy brownish red with yellow on the underside. The overall length of the Bolivian Green Macaw is approximately 28 inches, with a wing length average of 14 inches. A well-rounded diet is necessary for a Bolivian Green Macaw, as it will eat whatever it becomes accustomed to. In essence, the Green Macaw will be easily spoiled if fed too much “human” food. Variety, however, is good for the Green Macaw, so on top of a basic pellet formula for Macaws, the occasional pieces of fruit, vegetables and pasta are fine. Larger chicken bones may be given to the Green Macaw occasionally, as well, as they love to pick the marrow out of them. Otherwise, regular worming and visits to the veterinarian should be sufficient, unless your Macaw has special medical needs. In the wild, the Green Macaw breeds between March and August, building its nest in a tree hollow or a within a hole in a cliff and laying from two to three eggs. Breeding in captivity generally begins in June, and can usually be noted by the more aggressive tendencies of the bird. A hardwood box with thick walls and an entrance hole can be used for a nest. As the Macaw is a large bird, the entrance hole should be at least seven inches in diameter and the box itself should be at least 20 x 20 x 32 inches. The Green Macaw will generally lay a clutch of two or three eggs; four at the most, which will incubate for up to 26 days. The offspring should remain with the parents for at least two or three weeks and will remain fledglings for up to 12 weeks after hatching.